The divorce attorneys at the Peskind Law Firm have over 35 years of cumulative experience representing people in complex divorce matters. Our divorce attorneys understand that family and divorce laws frequently change, so they are continually dedicated to knowing these changes and how these laws can benefit you. 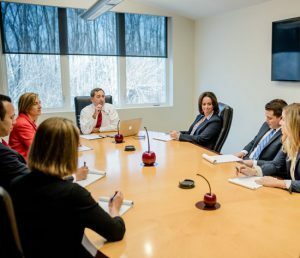 Unlike most family law firms, the Peskind Law Firm employs a variety of experts to help make these difficult times less stressing. We are one of the few law firms that has an in house Certified Public Accountant (CPA). We also have a Certified Divorce Coach on staff as well. If you have any questions about our family law services or if you are in need of an experienced divorce attorney in DuPage County, call us today at 630-444-0701. You can also reach us by filling out the contact form located on this page and one of our associates will get back to you as soon as possible. At the Peskind Law Firm, we are redefining the way family law is approached. We are one of the few law firms that employs an in house CPA. She assists the lawyers by analyzing complex financial information and prepares reports for the attorneys to utilize in court. She will also assist you with your financial planning during and after the case. We also have a Certified Divorce Coach on staff. Our Divorce Coach will help you create realistic goals for the trial and help you prepare for life after your divorce. Our firm frequently helps business owners, executives, and other business professionals and their spouses regarding complex divorce matters. We help people divide their property, resolve child custody cases, and address issues regarding maintenance and support. For more information on how our divorce attorneys in DuPage County can help you or if you have any questions regarding family and divorce law, give us a call today at 630-444-0701. Or simply fill out the contact form on this page and we will respond shortly.